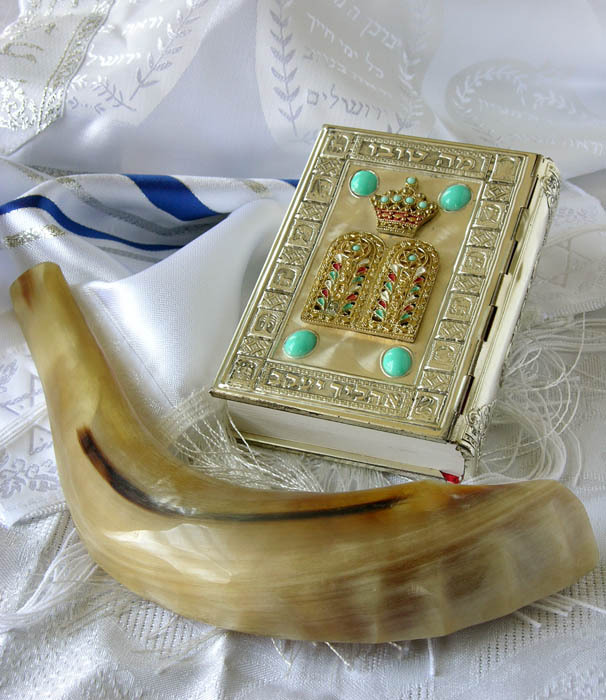 Tomorrow I am heading to New York City for a few days to spend the holiday of Rosh Hashanah with my family; I will also see art and friends. I would like to wish my Jewish friends a wonderful New Year, and to all my friends a time of peace and prosperity and joy. 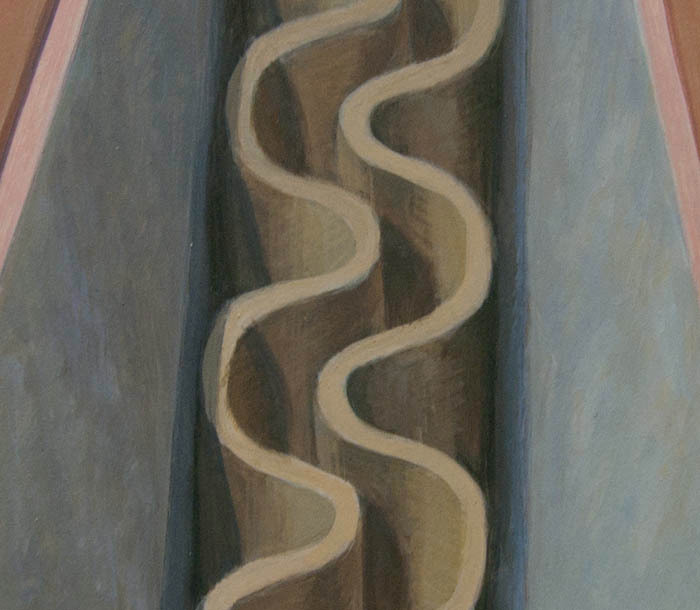 Overlap, egg tempera on calfskin parchment, 6 x 7 1/4 inches. When I began to work on this painting I had something like a minor fit of anger towards it: "No, no, I don't want to deal with this, with this level of detail." 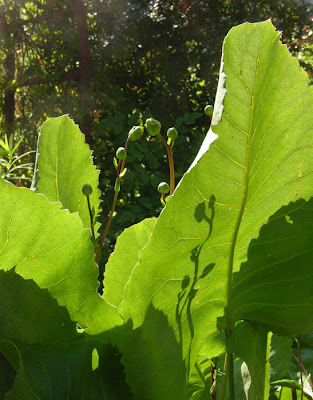 I planned to set it aside, wipe it out, and began a very lively discussion on facebook about abandoning work that you've begun, which you can see here if you're interested. The work started well enough: I liked the composition, the overlap of curving forms with minimal color. I always start my paintings with a very loose underpainting, and develop the form, color, and detail from there. I have to admit that I had no idea how I was going to move forward with this painting; how in the world was I going to tackle all those lines on the hoses? I couldn't just leave them out because they're a key to the energy of the image. So, when I got back to work the next day, I first started getting the forms in the right place and correct proportion, but the thought of the detail sent me into something of a nervous breakdown. I felt like throwing the panel across the room, but instead set it aside, and began to work on something else, the painting Middle Squiggle. One friend, on the facebook thread, commented that it sounded like I needed a day off. When I thought about this, I remembered how I had a similar feeling while cutting back a flower border: "I don't want to do this! I want to be doing something else, like painting!" 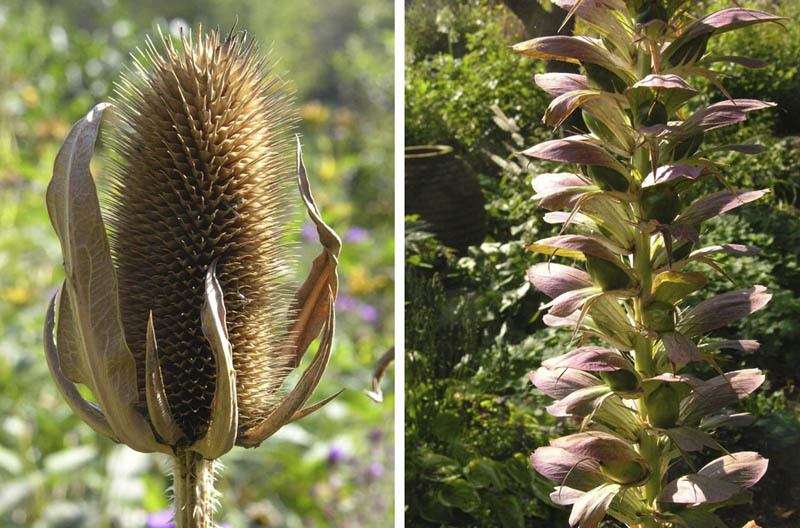 A couple of days went by and when I went back out to the flower border, I was determined to enjoy what I was doing then, to accept the moment and not bemoan it. 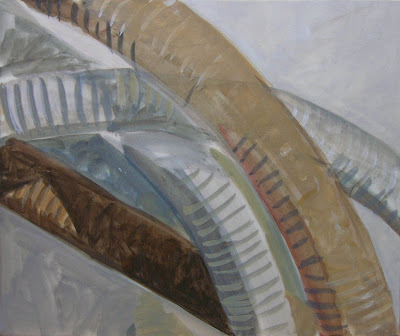 It made a huge difference in my feeling of pleasure, so once I finished Middle Squiggle, I looked again at Overlap and saw that I could complete it, if I calmed down and approached it with patience. What I finally understood was that I had to think about light, rather than detail; light would be the essence of the painting. Once I realized that, things went more smoothly. 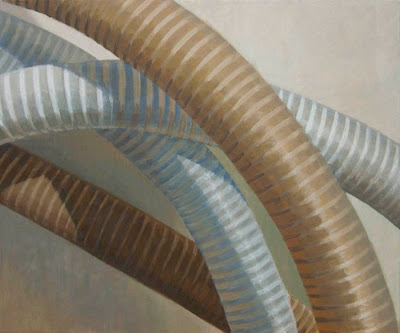 First I painted the wall behind the hoses, putting layer upon layer of warm and cool, darker and lighter color, until the surface looked like a solid plane and had weight and a presence in space. Using some warmer color in the highlights gave an added sense of luminosity. I was determined not to measure the lines in the hoses, but to paint them freely, eyeballing the distance between them; the most important thing was the quality of light, created by the relationships of color and value. I painted the lines in lighter paint, then painted over them, as part of the entire columnar form, again and again, changing color, making it lighter or darker, so as to get the sense of opaque and transparent light. 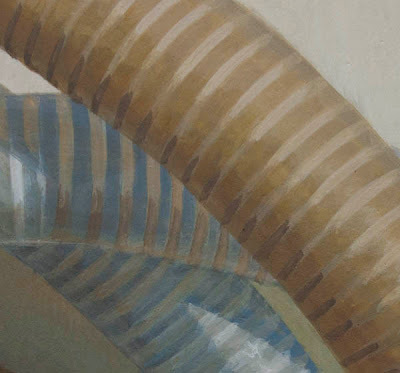 Because egg tempera is a translucent paint which dries immediately, it lends itself beautifully to this kind of handling. I wish I'd made the image a little larger, but I'm glad I pushed through with the painting, learning something along the way. James Ramsay, sitting on the floor cutting out pictures from the illustrated catalogue of the Army and Navy stores, endowed the picture of a refrigerator...with heavenly bliss. It was tinged with joy. To be silent; to be alone. All the being and the doing, expansive, vocal, evaporated; and one shrunk, with a sense of solemnity, to being oneself, a wedge-shaped core of darkness, something invisible to others. Although she continued to knit, and sat upright, it was thus that she felt herself; and this self having shed its attachments was free for the strangest of adventures. When life sank down for a moment, the range of experience seemed limitless. coherence in things, a stability; something, she meant, is immune from change, and shines out (she glanced at the window with its ripple of reflected lights) in the face of the flowing, the fleeting, the spectral, like a ruby; so that again tonight she had the feeling she had had once today, already, of peace, of rest. Of such moments, she thought, the thing is made that endures. One wanted...to be on a level with ordinary experience, to feel simply that's a chair, that's a table, and yet at the same time, It's a miracle, it's an ecstasy. Today is the autumn equinox, and the color in the trees is becoming more intense. Hues are also changing in the gardens around the house as the green chlorophyll in the leaves breaks down and as berries ripen. 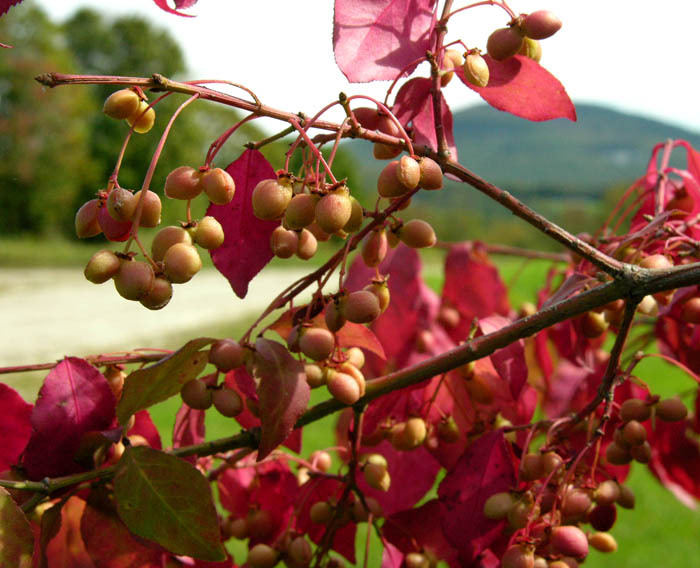 There is a large euonymus shrub in front of my studio, with an apt common name of Burning Bush, that turns a brilliant scarlet in the fall. 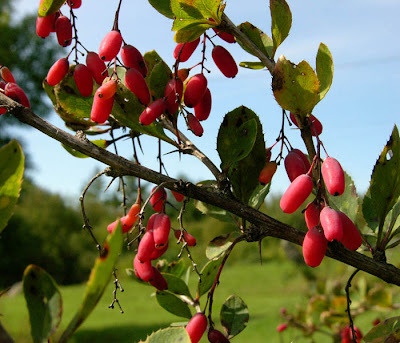 The berries are a favorite of birds and I enjoy watching them hopping about through the branches. 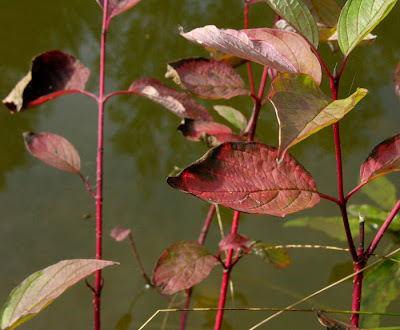 Several red osier dogwoods have seeded themselves around my pond; their leaves are a decorative red now and the stems will stay vivid throughout the winter. 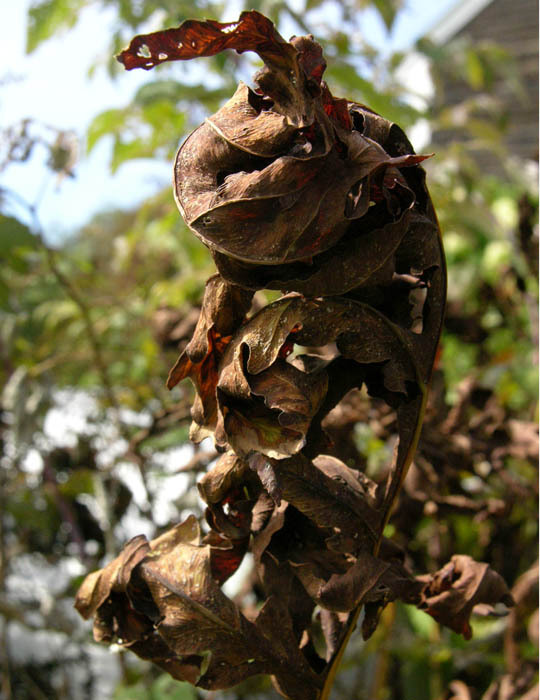 All the ferns are starting to die back, turning yellow to brown. From a distance a mass of dead ferns is a rich warm brown, a strong contrast with the still bright green of grass. 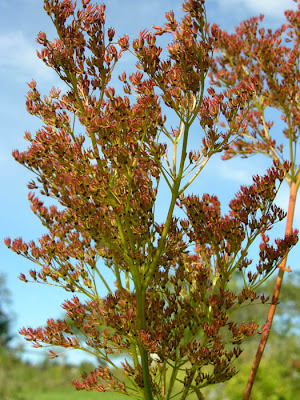 I love the way the frond has curled in on itself, like head and limbs bowing and gesturing obediently. The flower heads, now turning to seed, of the Filipendula rubra, or Queen of the Prairie, are a lovely haze of red. 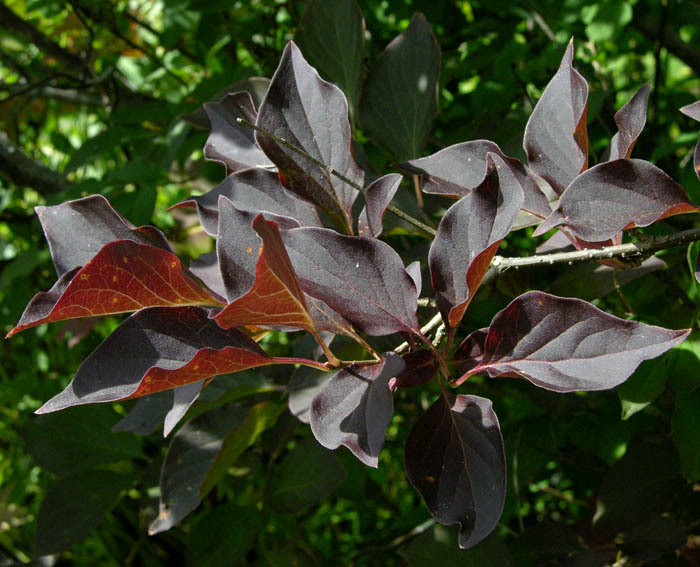 The most dramatic note in my garden is the fall color of the Miss Kim lilac, a deep plum purple which shows a dark cadmium red in sunlight. 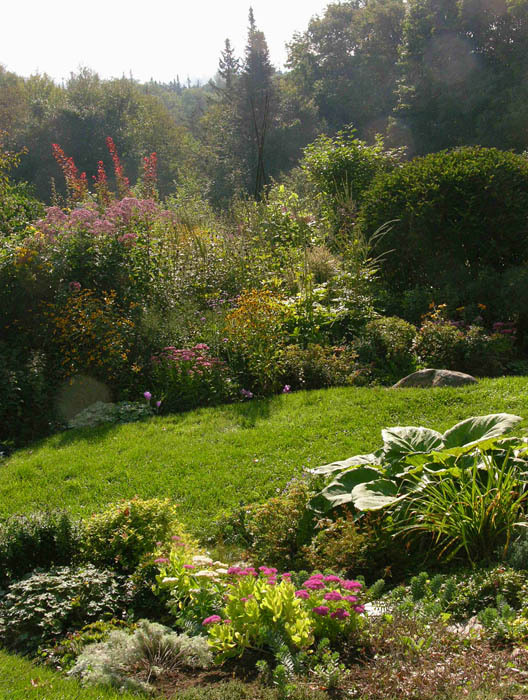 The large mass of this shrub in my flower border is a stunning backdrop for the variegated greens and yellows in front of it. And finally, the gorgeous berries of the barberry, a plant considered an invasive which was growing around my property when I moved here. It has terrible long sharp spines, but small scented yellow flowers in spring and these berries in the fall, another favorite of the birds. 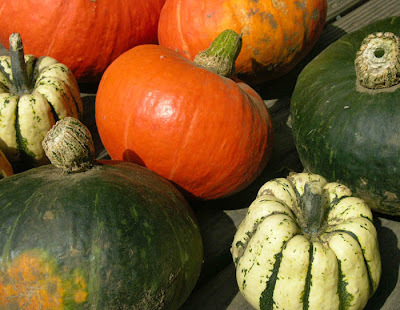 At this time of year each day brings a change, another thing to notice: orange here, a crimson blush there, green turning to yellow or sienna, before the world turns to umbers and white. Weave, hand dyed wool on linen, 10 x 10 inches. While I was doing some sketches for my next textile, I found myself playing with the idea of weaving, drawing lines moving on top and under one another. At first I drew wavy little mounds rising over the lines beneath, but then thought I'd keep the composition very simple: straight wide bands crossing one over the other, with small dark squares as background. 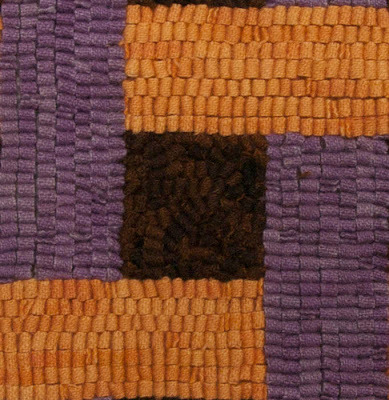 Orange and purple, intense secondary colors, are heightened by their contrast with the warm dark brown squares. 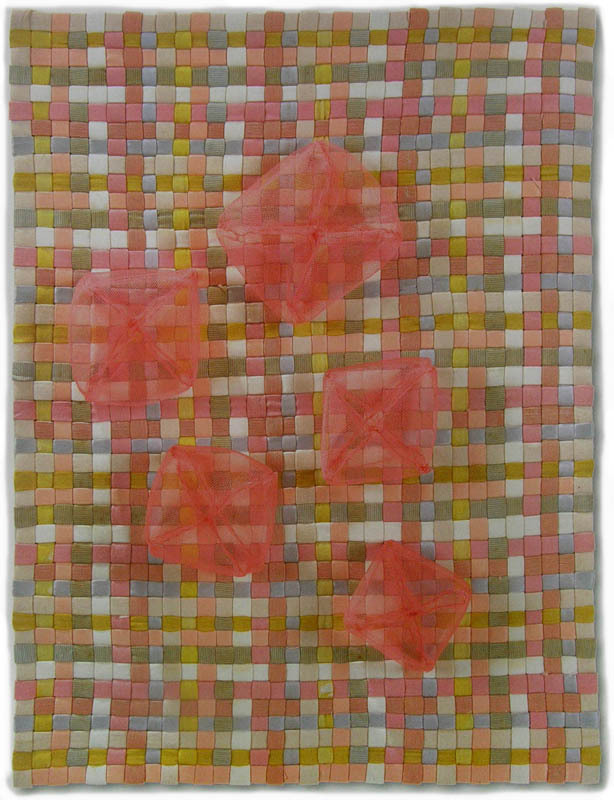 Louise Bourgeois, Untitled, 2007; fabric and fabric collage, 16 1/2 x 12 1/2 x 1 3/4 inches. 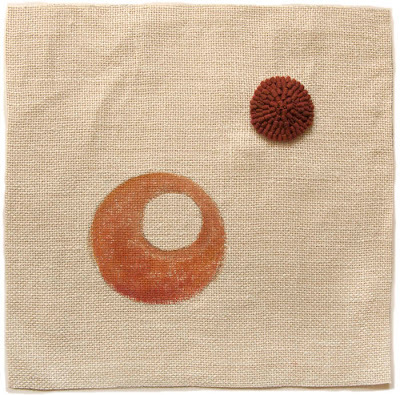 This idea must have come from happily browsing through a new book in my collection: Louise Bourgeois: The Fabric Works, which I purchased after seeing a show of some of these pieces in NYC in May. I was thrilled by the show, and wrote a blog post on it, which you can see here. In the work above, Bougeois weaves together thin ribbons of fabric to make a variegated ground for the airy puffs above it. I hooked the wool in straight lines, following the direction of the lines, with the background hooked randomly, to enhance the background effect. When I first sketched out this piece, I planned to have the orange lines as verticals, as in the right-hand image above. As I worked, it seemed to me that the orange was too dominant a color when the lines were vertical, so I turned the piece on its side. I don't know if this shows in the photo. I'm happy with this work, and it has me thinking about the idea of pattern. 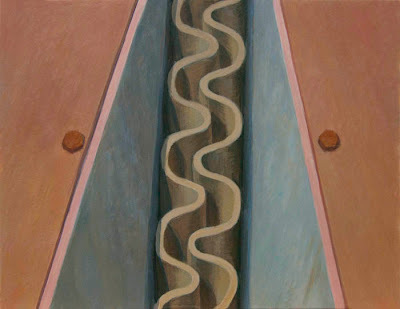 Middle Squiggle, egg tempera on calfskin parchment, 5 1/4 x 7 inches. Middle Squiggle was the working title for this painting; each image in my photo files has a title, some of which I change when I complete the painting. This image has a solemnity because of its very simple composition, but then there's that double curving line at its center, looking quite cartoonish. 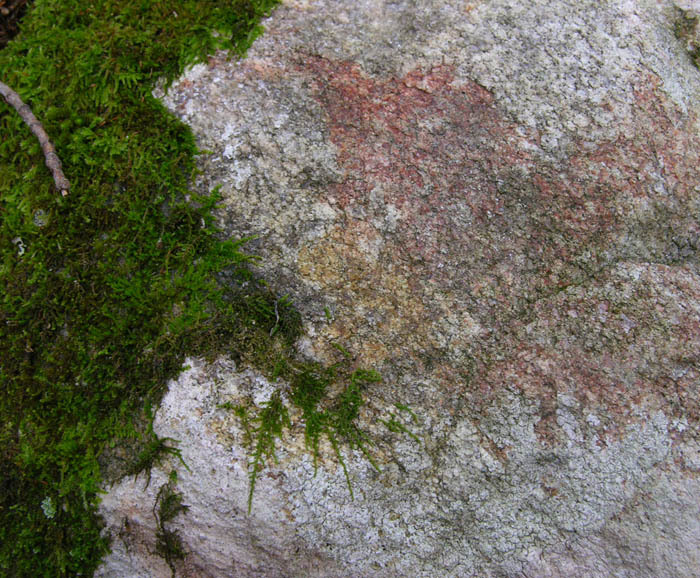 The two small bolts holding down the red planes at either side are small exclamations, "O! O! ", or little eyes. So the silliness of Middle Squiggle seems to work. 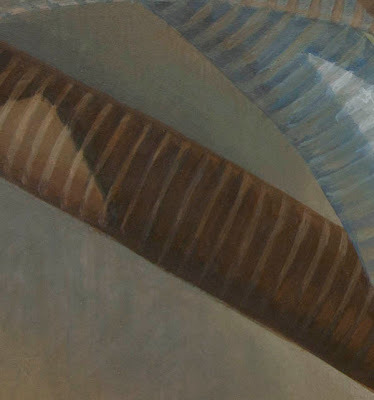 I enjoyed painting the form of the curving shapes, moving into and out of the light, warm-colored forms, almost architectural, nestled inside cool triangles. I am being completely honest when I say that I have no idea if this painting is a success. 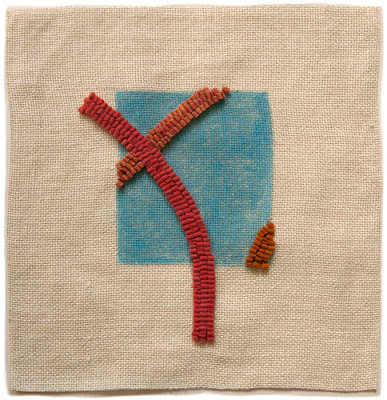 It may be too simplified to make sense, or maybe the balance of forms and color doesn't work. I do know that it's not a painting that has to go on the discard pile right away. 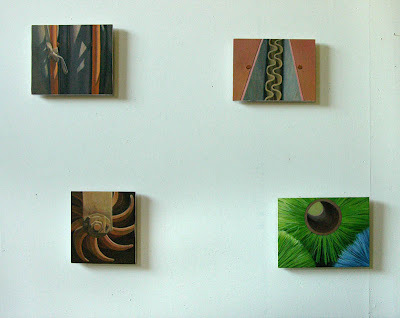 I photographed it along with three other recent works to see how they'd look together. What is interesting to me is how different each piece in this group is from the others, in form and in feeling, so maybe this newest painting will pass muster. Winslow Homer, On the Trail, 1892; watercolor, 12 5/8 x 19 7/8 inches. 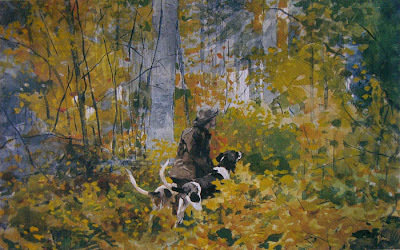 A man and his dogs, hunting, move through the dappled color of the autumn woods. This painting gets so close to the feeling of being surrounded by the sparkling flashes of yellowing leaves during later fall in my local woods, when the beeches are in their glory. Frederic Church, Birch Trees in Autumn, 1865; oil on paperboard, 12 x 7 5/8 inches. 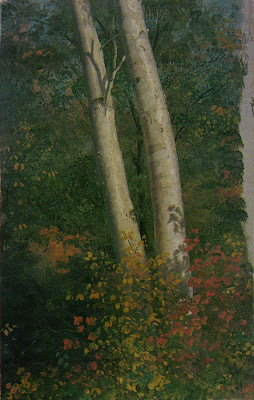 We are easing into the color of fall here in northern Vermont, and Church's oil sketch, with its dabs of color in a sea of green, deep against the white columns of birches, capture this time perfectly. Since this most spectacular of the seasons is upon us, especially in the Northeastern US, I thought I'd gather a few painted images of autumn, by American artists, photographed from books on my shelf. 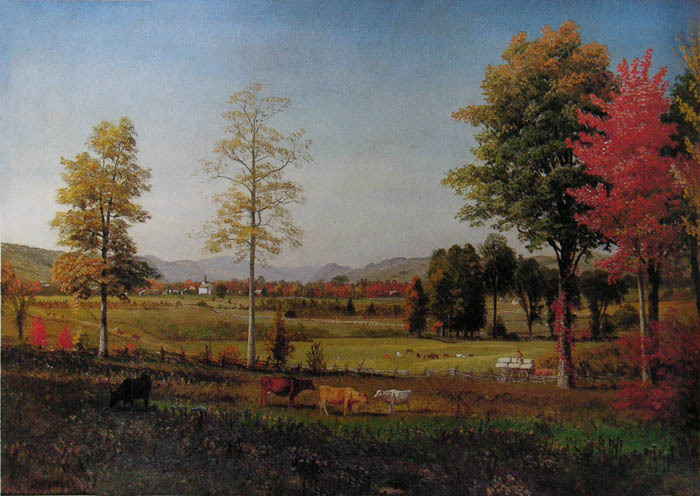 Thomas Chambers, The Connecticut Valley, mid-19th century; oil on canvas, 18 x 24 inches. I have a very soft spot in my heart for the paintings of Thomas Chambers; they are "naive" to be sure, but have such a strength of vision, quirky and appealing. The wacky red and green covered hill puts the color of fall leaves at center stage, with a peaceable kingdom of river and fields as backdrop. 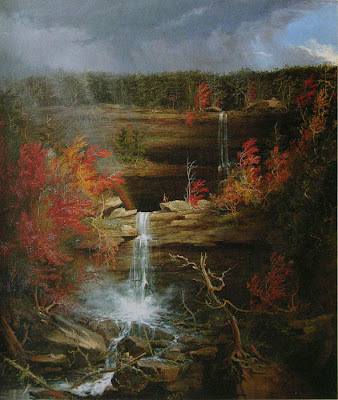 Thomas Cole, Kaaterskill Falls, 1826; oil on canvas, 43 x 36 inches. 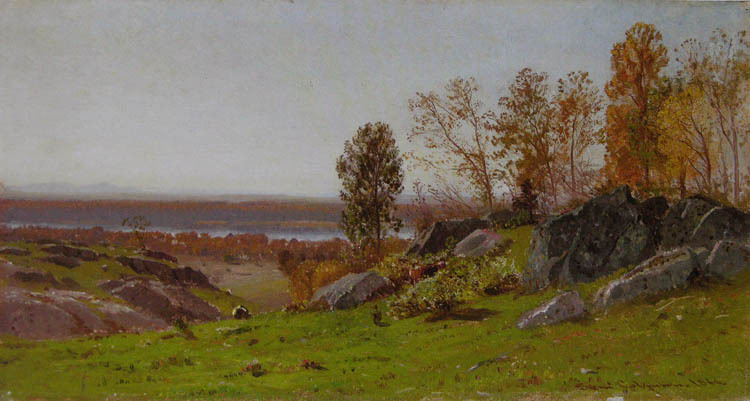 Albert Bierstdt, Eastern Landscape, 1859; oil on canvas, 20 x 28 inches. while Bierstadt, who we ordinarily associate with the wild grandeur of the American west, here paints a quiet domestic scene, with the peace and plenty of the fall harvest season. Samuel Colman, Landscape: Looking Across Country at Irvington-on-Hudson, 1866; oil on canvas glued to matboard, 9 1/4 x 16 15/16 inches. Here is another fresh, delightful sketch of a time of year when pastures are vivid green and the trees are showing their warm hues. 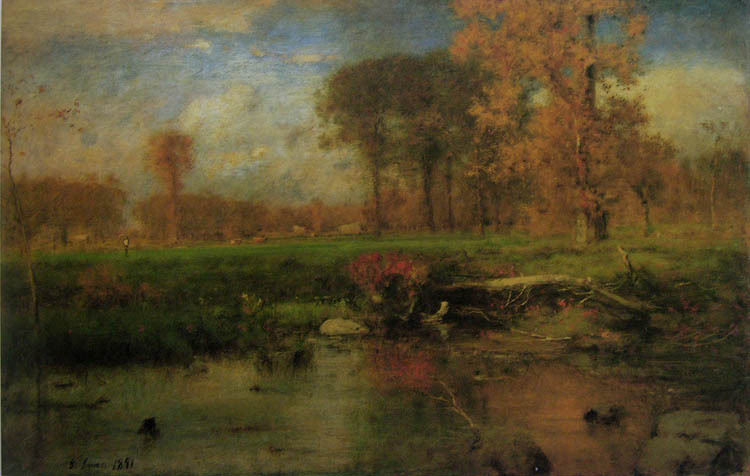 George Inness, Spirit of Autumn, 1891; oil on canvas, 30 x 45 inches. The lush color and soft, moist light, repeated in the foreground water, make this painting a poetic vision of autumn, as though remembered in a dream. 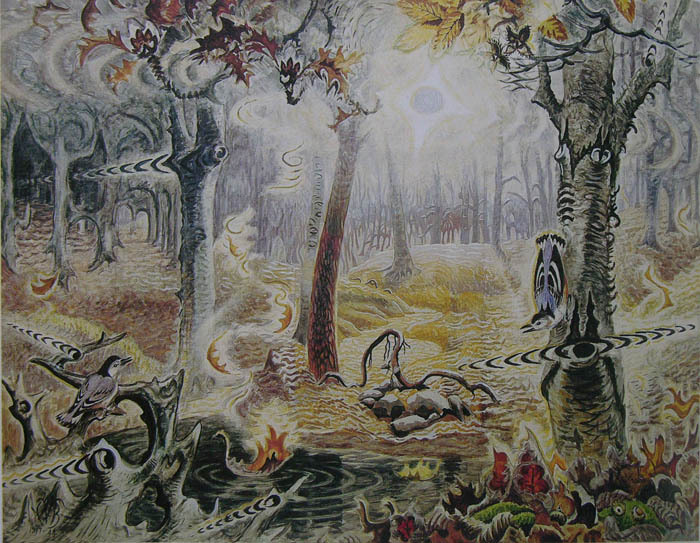 Charles Burchfield, Autumnal Fantasy, 1917-1944; watercolor on paper, 37 x 52 1/2 inches. 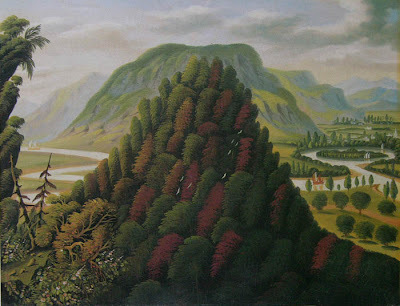 When I look at this intensely personal landscape, one full of spiritual light, I can't help but feel that the strongest element in it is sound: those black chevrons emanating from tree trunks and branches seem to me, as I sit here typing, to be the loud buzz of cicadas announcing the end of summer that I hear outside my door. The all-enveloping light, seen through an evening mist, the color of remaining leaves and those that spiral down, the racket of the bluejays and hum of insects, all combine into as real a picture of autumn as it's possible to imagine. The silvery sheen of frost lay on the grass this early morning, a light coating, soon melted. 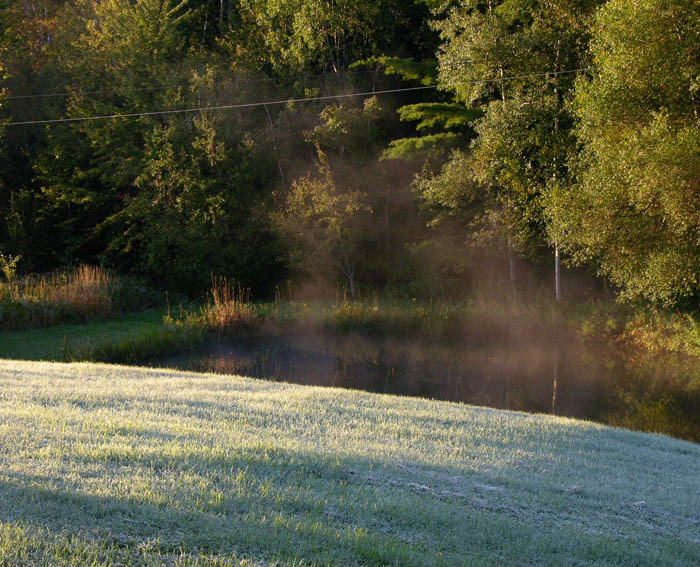 A mist floated above the pond, adding to the loveliness of the moment. 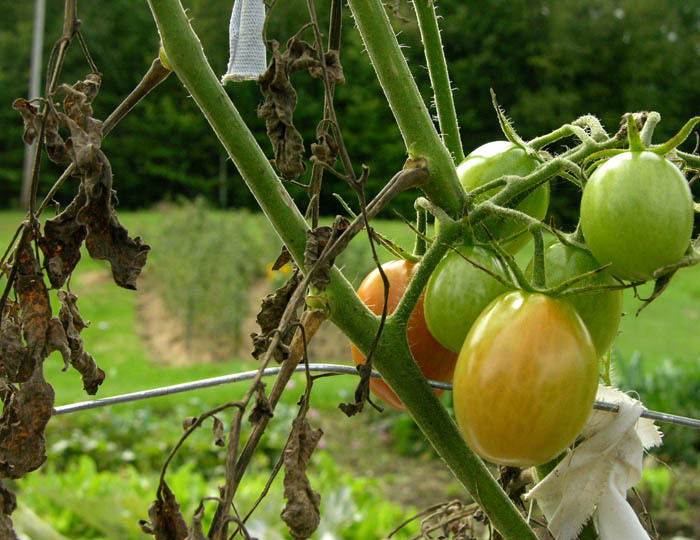 In the vegetable garden, only the very tender basil turned black from cold. 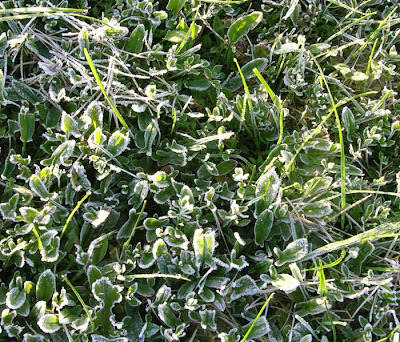 The lawn weeds had a delicately etched rim of white surrounding the green, making each distinct and decorative, as beautiful as a bejewelled brooch. 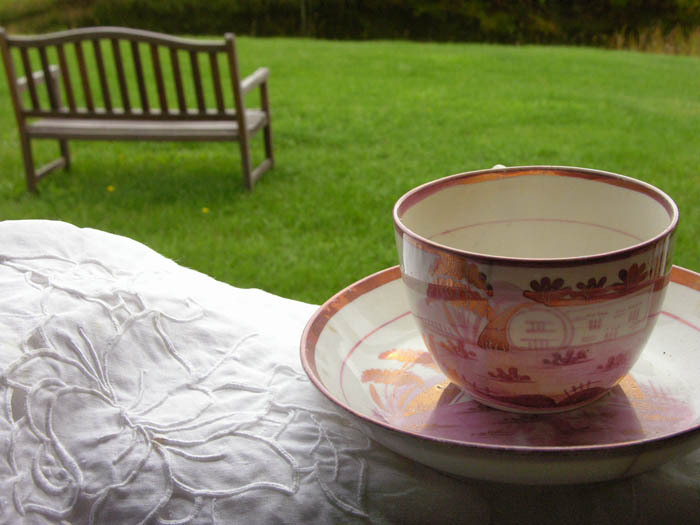 The time of quiet, little light, and chill will soon be here, but it brings with it its own pleasures. I so enjoyed a cold rainy day this week – a woodfire warming the house, a book, a pleasant meal – forcing me to stay indoors and pay attention to inner things. On the volumes of head-shaped stones, a white mask of lichen is surrounded by the deep greens of mosses. With the recent rains, there has been a burst of new life in the woods: mushrooms are popping up in enormous numbers and variety, and the mosses and lichens are thriving. 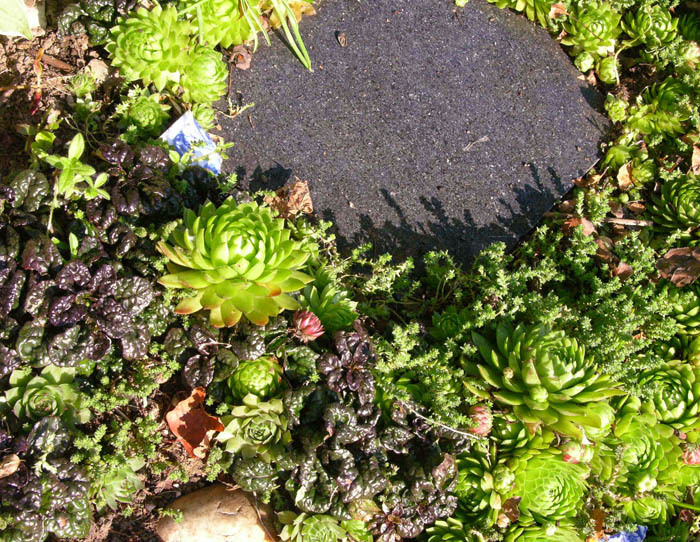 The greens of trees are beginning to turn to their fall colors, but the greens of mosses are more brilliant than they've been all summer. 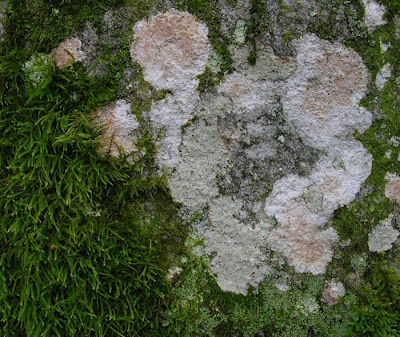 Lichens, too, are putting on a show. On my walk today I was particularly struck by the drama of color and texture on rocks, seemingly a surface inhospitable to life. 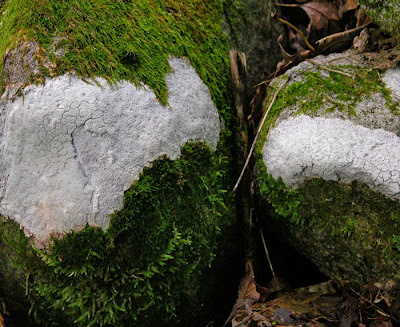 But just as there is life deep in the ocean and in harsh climes, the cold hard surface of stone provides a home for these simple living things. Seeing the dark verdant masses of moss and lighter lichens – with the bold note of lichen white – spreading down the rocks piled along a wall, I thought of the Hanging Gardens of Babylon, a possibly mythic creation, reproduced in miniature in the woods of northern Vermont. I love the markings of lichens on rocks, which look like someone has come along with buckets of paint, whites and pale reds and yellows; the artist covers a large surface, or places splotches here and there, sometimes leaving some of the background granite to add a different texture. 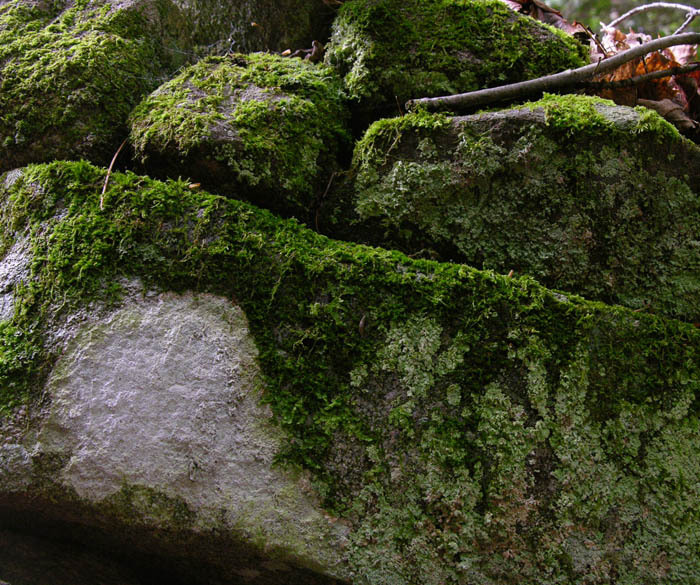 To add to the transformation, moss provides a cushiony softness; hard rock becomes gentle beauty. 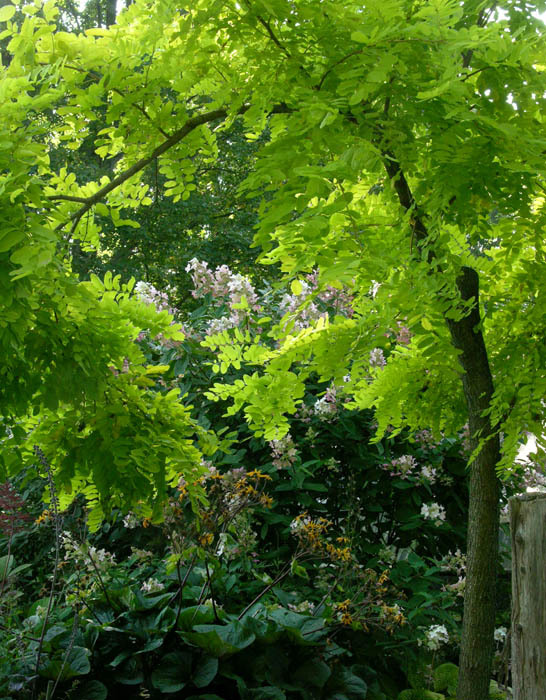 The first thing that struck me when I entered the space of my friend Chris Esten's remarkable garden were the gorgeous bright green leaves of the Robinia 'Frisia' tree, a type of locust. It captured light, and within the framing arch of its leaves were hostas and hydrangeas welcoming me to the rich colors and textures of September in northern Vermont. 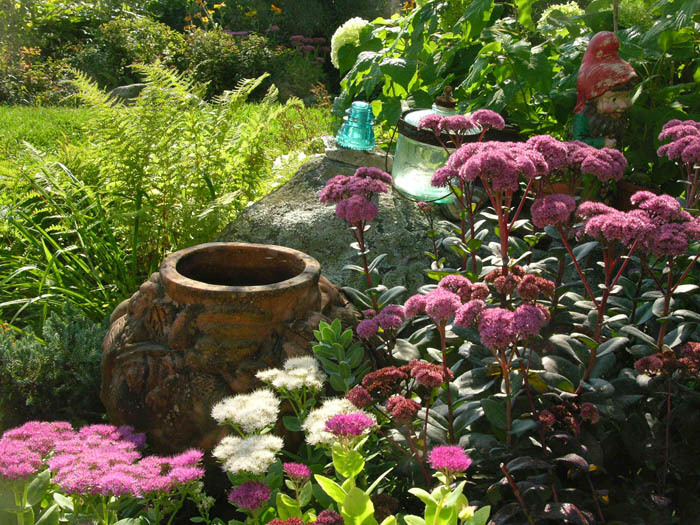 Although late in the season, the garden is full of color, with sedums and Joe Pye weed, autumn crocus and anemones, hydrangeas and heleniums. 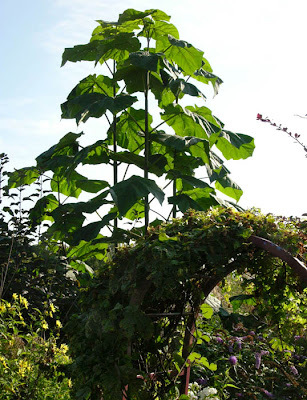 Chris is partial to large plants, and there are many that towered over me as I wandered the paths; there are also lower growing large leaved plants such as the one you can see in the smaller foreground garden. 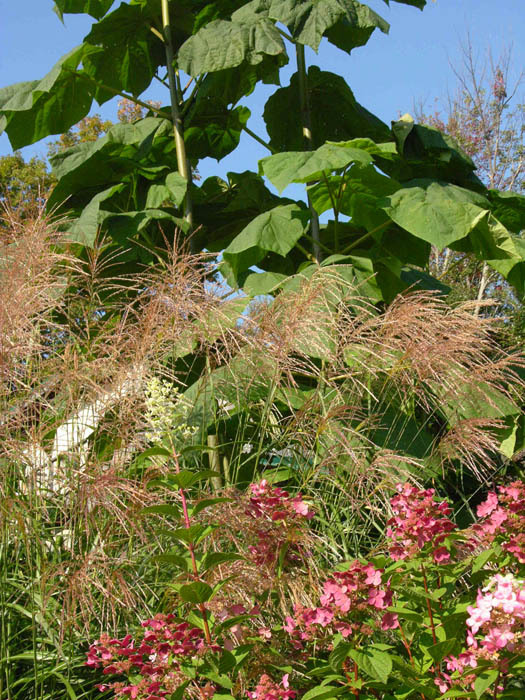 and forms a stunning backdrop to other large plants, such as grasses and hydrangeas. 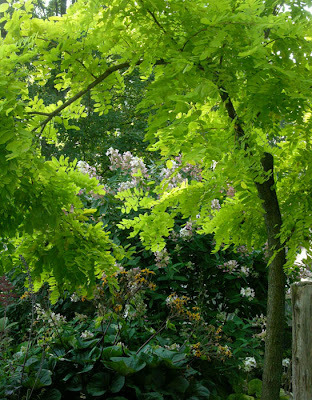 The large leaves of different ligularias and silphiums are a strong presence throughout the garden, and many are now blooming. This is a silphium, Prairie Dock. 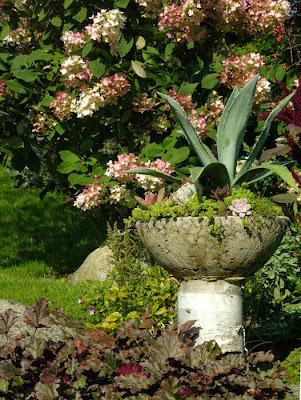 while a large pot set amid sedums adds an homage to craft. Alongside it is a boulder, on which balances sparkling glass objects and for a bit of fun, a garden gnome. A small garden of succulents is set with paving stones and small pieces of blue and white china; the variety of color and texture is dazzling. 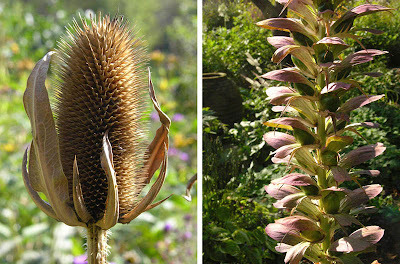 Chris has paid great attention to contrasts of texture throughout the garden. 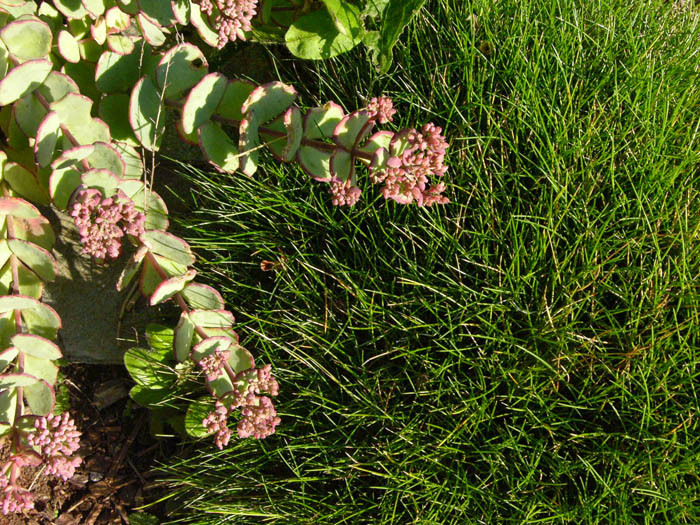 When I saw this patch of frothy grass, I immediately bent down to stroke it, thinking it would have the gentle softness of moss; I was sorely mistaken...ouch! But then there are the gentle, hairy lamb's ears. 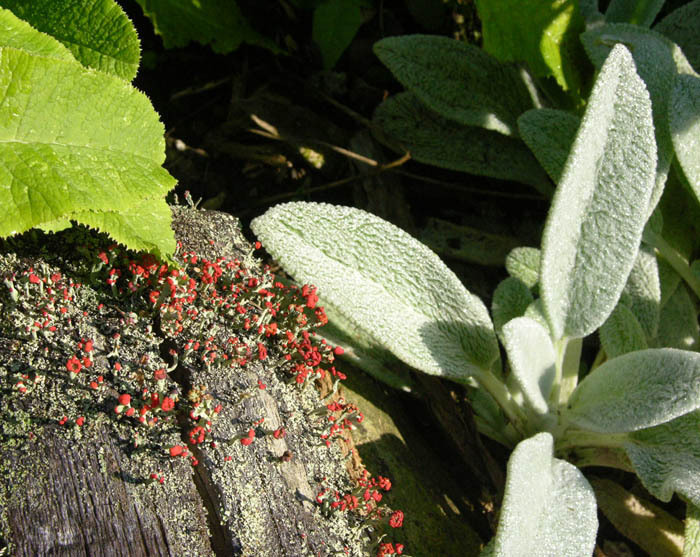 I loved this tiny composition: a small piece of wood, balanced on a rock, supports the red fruiting bodies of lichen, a piece of woodland growth brought into the cultivated garden. 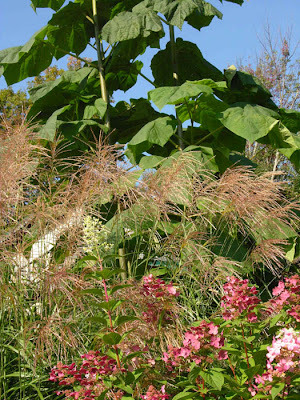 The seeds of autumn add another element of drama to the garden landscape; their clear forms, expressing the geometry of the Golden Mean, make us aware that amid all this fecundity is an abiding order. 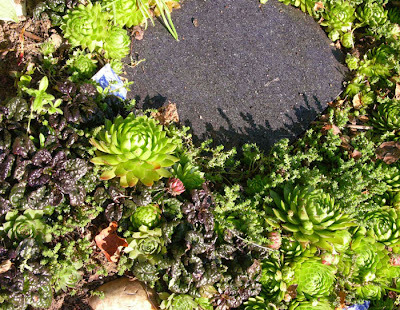 ❋❋ For my local Vermont readers: Chris Esten and Boots Wardinski, as The Green Reaper have plants for sale at the Capitol City Farmer's Market each Saturday in Montpelier. For more information, including contact info, go to the vendor's page of the market, here. 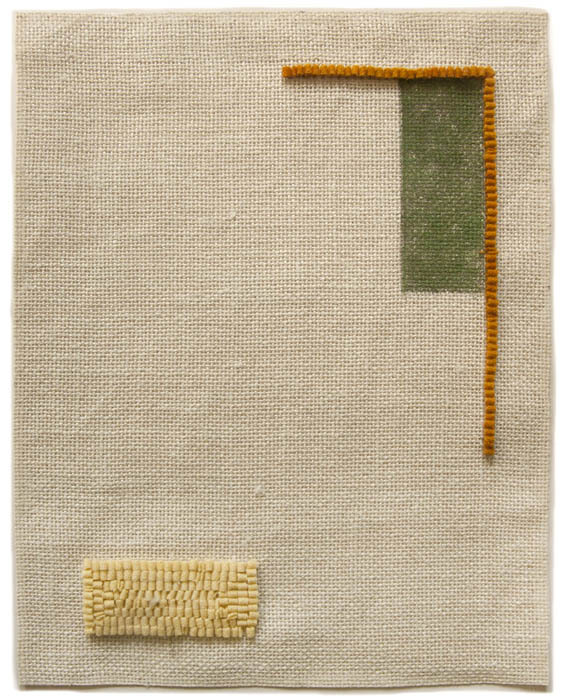 2011 #31, hand dyed wool and egg tempera on linen, 13 x 13 inches. Here is a new group of hooked wool drawings. I like to work on these in batches because the painting and hooking go rather quickly, while preparation and finishing take a while; it's more efficient for me to do several at once. When I first did the sketch for the image above, I was thinking of a satellite, as in a moon being spun off from its planet. Then I couldn't help but see a stuffed olive, or doughnut hole. With this imagery, how could this piece help but be a little humorous. I used colors that banished the olive idea, but did decide to paint the form to give it an illusion of volume. 2011 #32, hand dyed wool and egg tempera on linen, 13 x 12 inches. 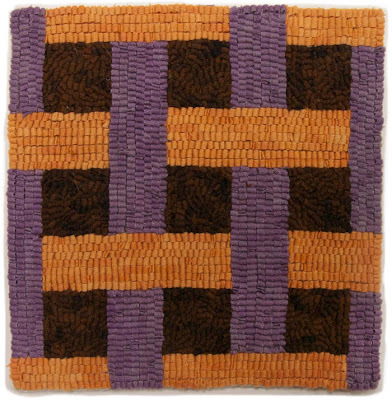 With this piece, I liked the idea of one form breaking out of its boundary box while the others are contained within it. 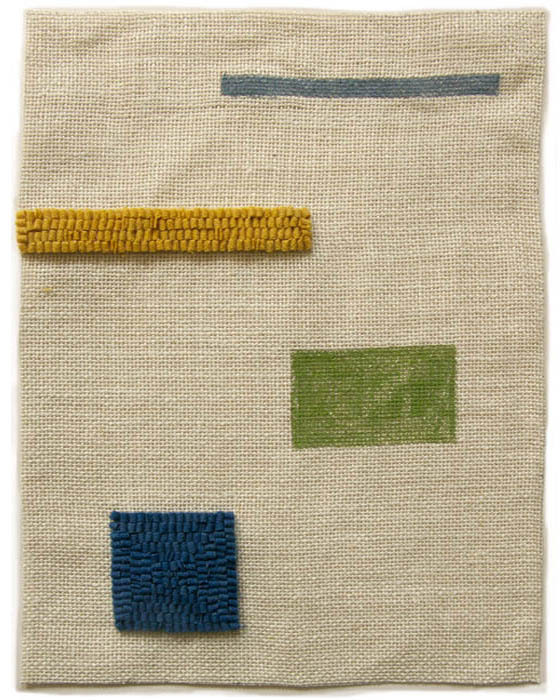 2011 #33, hand dyed wool and egg tempera on linen, 14 x 11 inches. When I first began this body of work, all the images were centered on the linen ground, which came out of my way of making sketches. In my last group, however, which you can see here, I tried something new: working across the entire surface, either filling it, as above, or leaving a dynamic empty center as in #34 below. Because I'm a representational painter, I do sometimes worry that I'll run out of ideas for the non-objective textile work, but it hasn't yet happened; opening up this drawing process helps in limbering up my mind and hand. 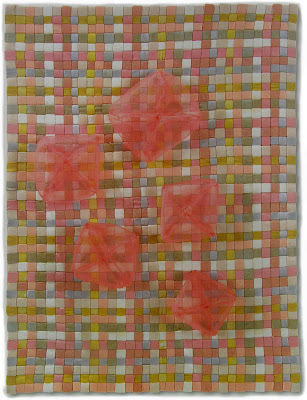 2011 #34, hand dyed wool and egg tempera on linen, 14 x 11 inches. Although today is a summery day, with sun and mild temperatures, the vegetable garden is signaling that autumn is on its way. The winter squashes are ripe; I cut them from the dying vines a few days ago and now they brighten my porch as they cure in the sun. 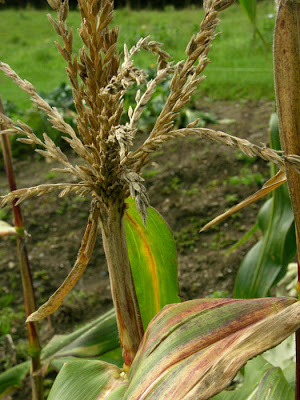 Corn, which signals summer, is now finished, the ears eaten or frozen for winter. The tassels have dried and the leaves colored. Some of the tomato plants are still valiantly ripening tomatoes, even though much damaged by early blight. 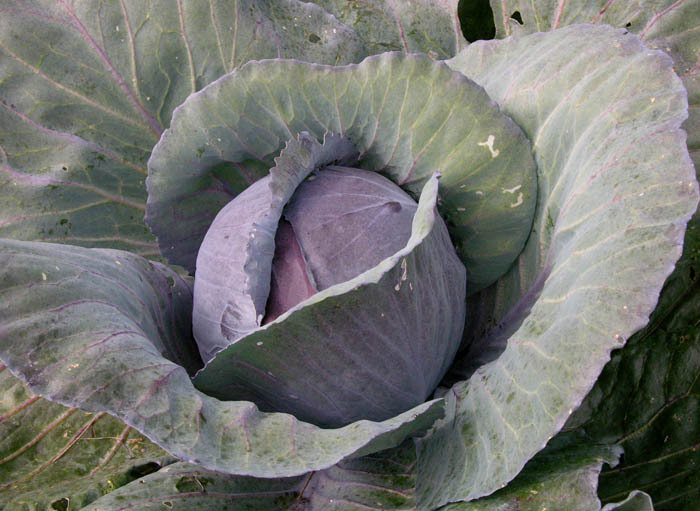 As fall makes itself more evident, with cooler temperatures and warmer color in the trees, I begin to think of the cool weather crops, especially the brassicas. I think red cabbage is one of the most beautiful plants in the garden, with its large purple-green leaves embracing the deeper red head at their center. My lunchtime cravings begin to turn from lettuce salads, which for me speak of spring and summer, to those made with cabbage. 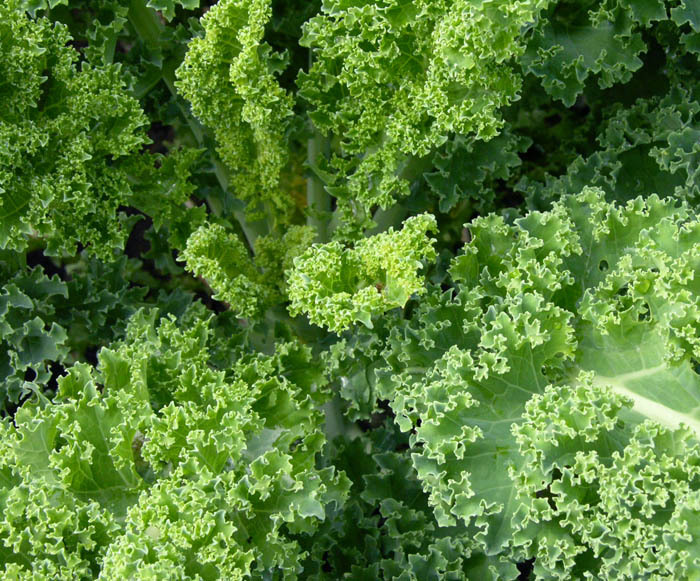 as does kale. Both vegetables become sweeter and more tender after frost. 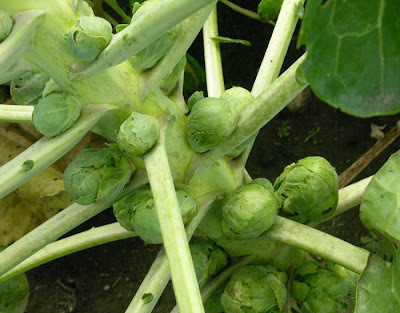 The gorgeously ruffled leaves of kale adds a frilly beauty to the garden, while Brussels sprouts are an illustration of the order of nature since the sprouts and leaves, in their arrangement along the stem, conform to the Golden Mean. 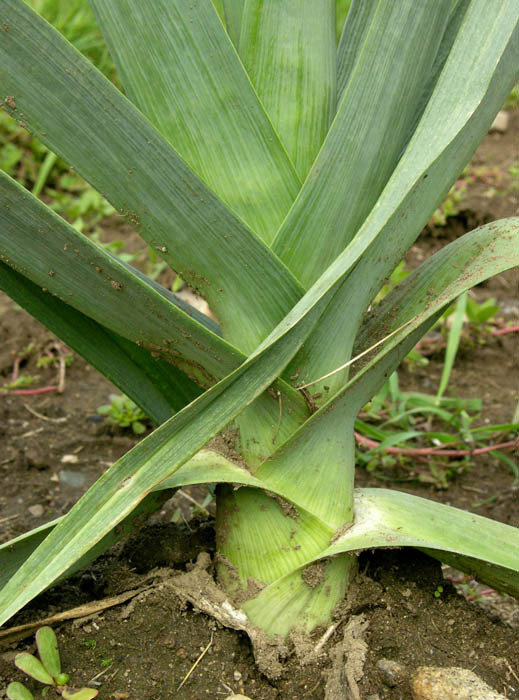 Leeks are another stunning plant in the garden, their long blue-green leaves overlapping in a regular pattern along the shaft. I hill soil up against the plants during the summer, for more tender white, hidden underground. How could I be sad to see summer go, with all these delicious meals to come?